Modern touch screens will two finger pan and zoom all animations and structure ID pages, videos pan. Sliders provided for non-touch screens. Screen shot white board to file for easy email and printing. Programs delivered via thumb flashdrive. 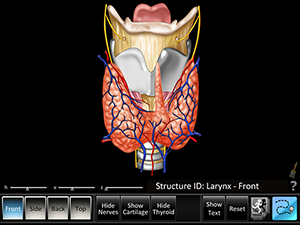 Screen grab shows the laryngeal structure - build from hyoid bone to thyroid and watch animations of function from multiple viewpoints. 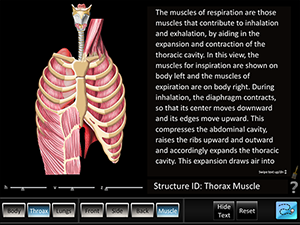 View the key parts of respiration for the body, head and larynx, plus animations of inhalation and exhalation for thorax, lungs and body. 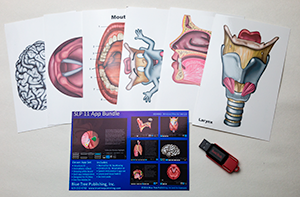 See and hear the formation of vowel and consonant sounds with animations and descriptive, context driven text. 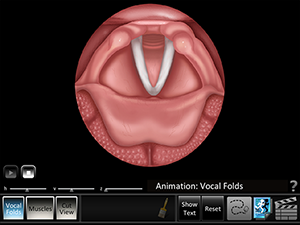 See the vocal folds in motion - also includes endoscopic filmed images. 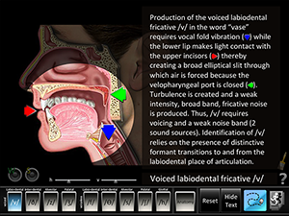 Highlight anatomical features with glossary. 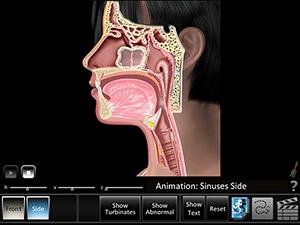 Top, frontal and side views demonstrate sinus function, anatomy and someanomalies, with animations and video. 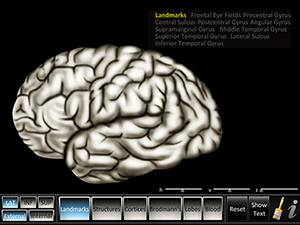 View the complex anatomy of the brain, with cutaways and context related text to illuminate anddescribe anatomy and function.